The Seymour Duncan STC-3P Preamp is a preamp that offers high headroom, low-noise, 3-Band active onboard EQ preamp designed for use with passive pickups and comes with prewired 4-knob harness. Seymour Duncan Tone Circuits will add a tremendous amount of on-board tonal versatility to any dual pickup bass. Seymour Duncan’s design enables players to add or subtract specifically focused frequencies in order to achieve signature tones and to dial in a great sound no matter what the situation. The STC-3P Tone Circuit provides bass and treble controls, a master volume, a blend control, and our proprietary Slap Switch. The treble control can produce a wide ranging, extremely usable response that is brilliant, yet smooth without being brittle. Our midrange control can be used to just slightly remove excess midrange honk or to add sonic power that will really make solos jump out. The bass can be reduced to tighten up a boomy instrument, or it can be increased to add warmth and punch. The Slap Switch is a push/pull located on the volume control. Pulling up on the volume knob will engage the special EQ contour voiced specifically for slap playing. The two small trim pots on the circuit board can be tweaked to preset the slap contour EQ just the way you want. The STC-3P will work in any bass that is equipped with two passive pickups and has space for 4 control knobs (volume slap switch, blend, concentric bass and treble controls) and a single 9v battery in the control cavity. Two 9v batteries can be wired together in series for added headroom. 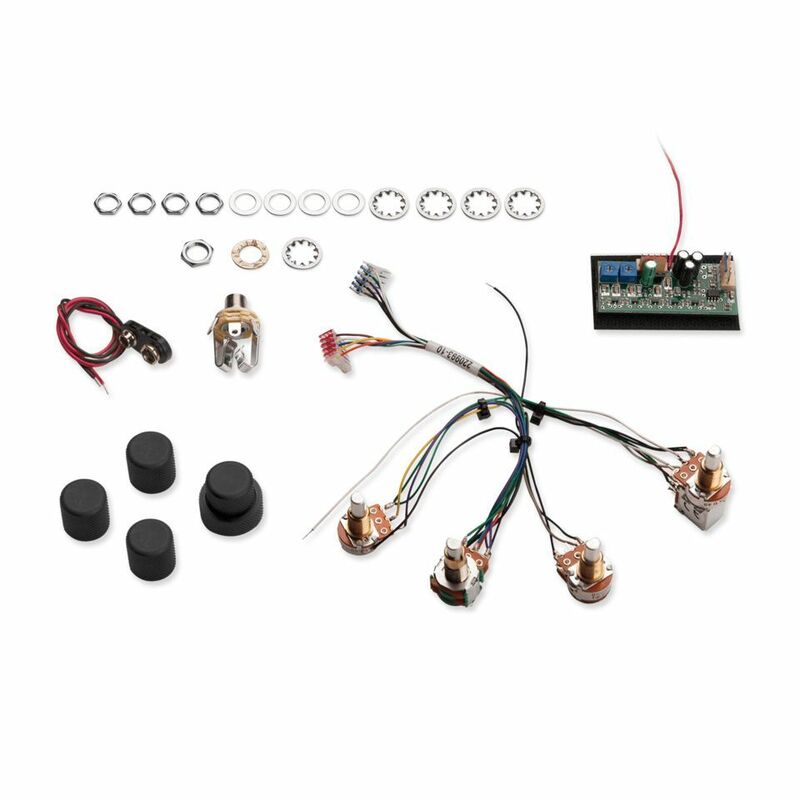 All necessary mounting hardware high-quality potentiometers on pre-wired harness; battery clip; stereo jack; and black anodized, knurled, dome-style knobs are included within this package.